In a military and navigational context, direction finding is procedure for finding the bearing of a source of electromagnetic energy, usually a radio or radar transmitter. By taking multiple bearings, from several different, accurately positioned sites, and plotting the bearings on a common map, it becomes possible to determine increasingly exact positions of the source. The technique of locating emitters by the intersection of different bearings is also called goniometry, a general technique of angular measurement. The classic method of taking the bearings uses highly directional antennas connected to sensitive receivers. Newer methods involve synchronizing a set of receivers to a common time reference, and then measuring the time-of-arrival of the emitted signal at the various receivers. The different times of arrival of the signal, at the speed of light, gives a distance to the emitter, and plotting the distances also will cause convergence on the location of the emitter. Some direction finders combine time-of-arrival with directional antennas. Time-of-arrival lends itself to use by air and space based receivers. In the Second World War, the system of high frequency HF direction finding (DF), HF/DF (pronounced huff-duff) was critical to anti-submarine warfare in the Battle of the Atlantic. 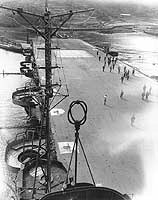 As well as a chain of shore-based intercept stations, many warships also carried Adkins-type loop directional-antenna intercept receivers, the only practical method since sufficiently accurate time references were not available. These were commonly circular loops on turntables, although some other flat geometries, such as diamonds, were used. During the Cold War, strategic SIGINT stations using very large Wullenweber antenna arrays were established worldwide; the Wullenweber antenna used circles of fixed directional antennas, rather than a rotating antennas used on the HF/DF stations. The intercept receiver at Elmendorf, Alaska, is shown. Its inner ring was 230 meters in diameter, with 40 antenna elements and an outer ring about 260 meters in diameter consisting of 120 monopoles. 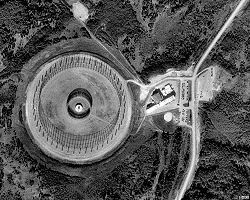 The whole array is surrounded by a ground shield some 400 meters in diameter. Again, these largely have been replaced by time of arrival and time difference of arrival methods. Almost all the Wullenwebers, informally called "elephant cages," have been demolished. Various electronic navigational systems involve direction-finding principles, although these now tend to be backups to time-of-arrival techniques such as the Global Positioning System (GPS). It is possible to determine one's own position by taking bearings to transmitters, or perhaps radar reflectors, at known locations; the bearings to the known positions will cross at one's own position. When more accurate methods are not available, this can be a useful nautical navigational technique, especially when using highly directional radar references.